We’ve all heard about the proverbial canary in the coal mine. In the days before air quality monitoring technology was developed, canaries were put into the mine shafts because they were especially sensitive to dust and gas in the air. If you were a coal miner and you noticed that the canary wasn’t chirping any more, you knew it was time to grab your pick and hurry back up to the surface. Is the restaurant sector the canary for the modern American economy? Some economists think so. They reach the logical inference — one that I’ve seen substantiated by personal experience in the past — that people are more likely to eat out when they’ve got cash on hand, and less likely to eat out when they know they’ve got to tighten their belts. Going out to eat is one of the first “luxury” expenditures to hit the cutting room floor when times get lean because people can save money by making their own food and eating at home. If restaurants are, in fact, a leading economic indicator, the canary may be indicating that tough times are ahead for the American economy. Restaurant and bar sales have fallen in three of the last six months, and analysts have downgraded the stocks in the chain restaurants that are staples of the strip malls found at every crossroads in America — places like Chipotle, Panera Bread, and Cheesecake Factory. One analyst says that the performance of the restaurant sector looks remarkably like what it was in 2000 and again in 2007, right before the last recessions hit. Analysts also are noting that, in addition to declining consumer spending, restaurants are facing business and profitability challenges due to changes in overtime regulations and increases in the minimum wage. The U.S. economy is so sprawling and multi-faceted, it’s hard to pick one area as the true canary. But if the restaurant sector is the right choice, it may be time for the American consumer to start heading for the open air. 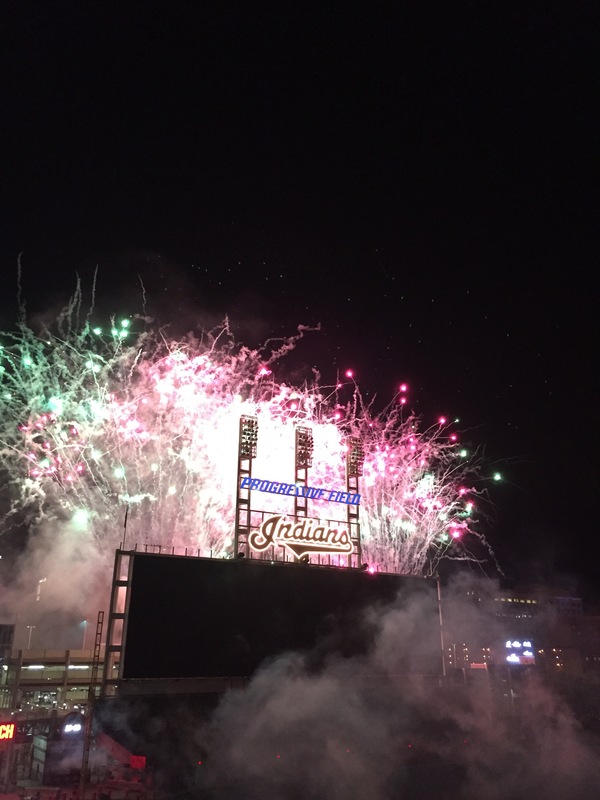 Tonight we saw a Tribe win and a great fireworks show. Is this a great country or what? 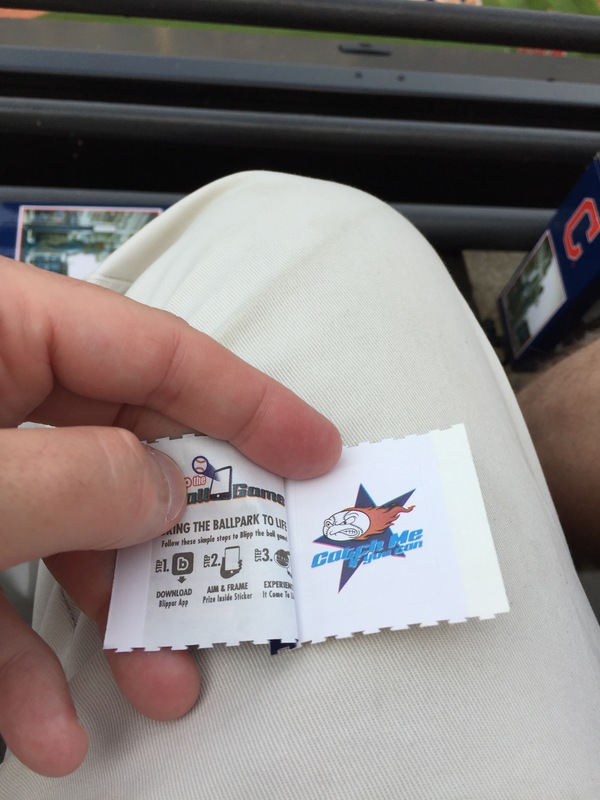 We bought some Cracker Jacks at the Tribe game because . . . well, the song says you’re supposed to. The prizes really blow now, though. I remember when, as a kid, I got metal toys in a Cracker Jacks box. Now it’s some unknown sticker. Pretty lame! Walking around downtown this week, I was glad to see another site where guys in hard hats were hard at work. This one was at Gay and High, where construction workers are ripping up a dismal surface parking lot and getting ready to begin building another multi-story, mixed use, retail/office/residential building. The Gay Street site joins a slew of other downtown Columbus building sites, which can be found on lots next to the police headquarters, at the Convention Center, and across from the Columbus Commons on High Street, and ongoing rehab work on the long-empty buildings on the other side of the intersection of Gay and High. All told, the Capital Crossroads Special Improvement District, which covers the downtown area, estimates that about $500 million of construction work is underway and another $1.2 billion is in the pipeline. This is good news for a lot of reasons. Downtown Columbus is in the process of reinventing itself, transitioning from a purely commercial zone of buildings and parking lots where there was no activity whatsoever after 7 p.m. to an area where people live and work and certain neighborhoods, like Gay Street, are developing their own distinctive, 24-hour-a-day vibe. The Capital Crossroad District estimates that the number of people who live downtown has doubled since 2004 and now stands at about 8,000. That’s not a huge number, but the trend lines are obvious and the change in atmosphere in the downtown area is obvious, too. It’s gone from a silent, empty place in the non-business hours to a place where people walk their dogs, jog, and have a hearty brunch on Sunday morning. The construction boom is good for downtown and for construction workers, of course, but it’s also good for the entire central Ohio area. I’d like to see the outward suburban creep end, and the focus instead be on growth at the core. Let’s reuse, recycle, and reorient the existing streets, bridges, and infrastructure, replace the sad surface parking lots in the downtown area with residential buildings, entice more people to live downtown — and in the process avoid grading and paving over any more of that pretty Ohio farmland. If you walk around your town, you’ve probably noticed this already. I’m talking about the number of people who are going from Point A to Point B, carrying a coffee cup or water bottle. I’d say at least half, and maybe more, of the people out and about these days are fully liquified and ready to immediately hydrate or caffeinate. It’s kind of strange when you think about it. It’s as if these folks can’t bear to be away from the liquid of their choice for any length of time, so they carry it with them — even if they aren’t actually drinking from the cup, or mug, or jug as they walk along. And I’m not talking about people who have just emerged from the nearest Starbucks with a pumpkin latte and are heading back to the office, either. I’m talking about people who seem to carry their containers at all times. One of my fellow walkers from German Village to downtown Columbus always carries a cup of coffee with him on his stroll to work, and he never takes so much as a sip. Of course not! If you try to take a drink when you’re walking you’re risking a spill, and coffee stains are hard to remove from clothing. That begs the question: if you’re not going to actually drink the liquid you’re lugging around, why carry it with you in the first place? As somebody who prefers to walk unburdened by water bottles and coffee cups, I conclude that there are two potential explanations for this. One is that the water-bearers have become emotionally attached to their liquid containers and their contents, and that constantly carrying them around provides some kind of comfort. The other is that this is all part of some new exercise regimen. Somewhere, some fitness guru has decreed that the muscles surrounding the crook of the arm are under-exercised, and that the best way to deal with the issue is to carry around small containers and maintain the arm perpetually bent at the elbow, with the lower arm and the upper arm forming a 90-degree angle, for extended periods of time. Only by doing so will the biceps and triceps, working with the ulna, radius, brachioradialis, tendons, extensors, and flexors, get the full workout that they really need. Call it Coffee Cup Conditioning, or the Water Jug Workout. The Scotsman and I were out and about in downtown Columbus yesterday when we were stopped by a TV reporter and asked a few questions about whether we thought light rail made sense for our fair city. Surprisingly, snippets of our comments actually made it on the air. You can watch the segment, which aired on WBNS-TV, here. I hope the Bus Riding Conservative appreciates my comments about cost!